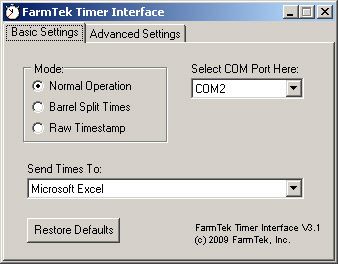 The Timer Interface Software make it easy to interface one of our timers to popular Windows applications. If you have designed a record keeping spreadsheet, database, or other application that has a spot to type in a rider's time, the timer interface software will automatically "type" in riders' times for you as they come in from the timer. The timer interface software receives times from the timer via a serial port or USB port on your PC and sends the times to your application as a series of keystrokes – exactly as if you had typed them in on the keyboard. Since the time is sent as keystrokes, virtually any spreadsheet, database, or similar application can receive times from one of our timers without any special programming. Try the Timer Interface Software free for 30 days. Click here to download a self extracting file that will install the timer interface software on your computer. Note: If you do not already have the computer interface cable, do not install the software at this time as the 30 day countdown will start immediately, and without the cable, you will not be able to evaluate the software. The Timer Interface Software will work for 30 days after installation. To continue using the software after the trial period, you can purchase a registration code below to unlock your copy of the software. This purchase provides the buyer a registration code that will permanently enable the trial copy of the software on the computer in which the software is installed. Connects the Polaris console to a serial or USB port on your computer.